Easily keep your kayak up and off the ground. 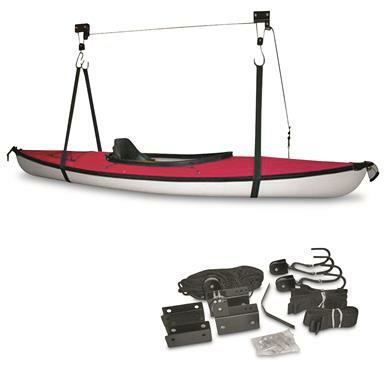 Make use of all the space in your garage or storage area with the Atwood Kayak Hoist System. Two easy lifting pulleys can be mounted on either finished or open ceilings. Place the 2" wide webbing strap slips onto the dual hooks of the pulley, slip it under your kayak and up, up, and out of the way it goes. You can also use this system to keep bikes, ladders, and other recreational toys up to 120 lbs. out of the way. Includes all mounting hardware. Attwood Kayak Hoist System is rated 5.0 out of 5 by 1. Perfect for camping, vacationing and exploring remote areas! Add underwater viewing capability to any RCA-enabled sonar or TV / LCD monitor. Delivers live streaming video and more to your smartphone or tablet. An effortless way to hang and process big game.